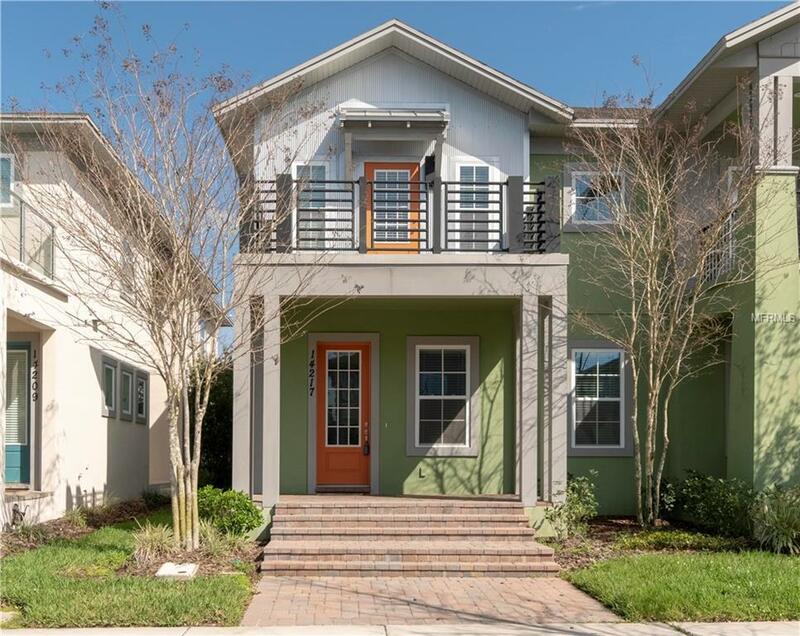 Enjoy the amenities of Lake Nona living in this beautiful Laureate Park townhome. A paver walkway and covered front porch welcome you to this lovely townhome with many upgrades including a freshly painted interior. The open concept first floor is naturally illuminated and is accented with stunning hardwood floors. Overlooking the dining and living rooms, the kitchen features stainless steel appliances, an oversized island with breakfast bar, quartz countertops, 42 dark wood cabinets, tile back splash, and a walk-in pantry with plenty of storage space. A half bath, a butlers pantry and a lanai complete the downstairs. The master suite features a huge walk-in closet and provides French door access to a private balcony. A pocket door leads to your en suite bath with double sink vanity and glass enclosed rain shower. Completing the upstairs is two additional bedrooms, a full bath, a laundry room, and an office nook. Located a short distance from Lake Nonas Medical City and Town Center, this community offers many amenities including a resort style aquatic center with two pools, fitness center, dog parks, community garden, playgrounds, sand volleyball and access to 44 miles of walking, jogging and biking trails.